One airplane, that's all I ask. I sit in the terminal at SFO, waiting patiently at gate 79 for United to find an airplane to deliver me back to Eugene after a grueling five days of business. It seems the plane they scheduled for the route hasn't left Calgary yet, so we are delayed three hours...that's three hours that they'll cop to. And everyone knows that in airline time, three hours is usually more like five or six. Now I realize there can be bad WX in North America this time of year, but I all I want is one airplane. Just one. You'd think that because United is such a large carrier, they'd have a couple of spares locked and loaded, ready to slip into the system when things go sideways. Yeah, right. I know what you are thinking...delayed departures are so common, they are not really worth bitching about in a blog. And call me jaded from six+ years of Washington lies, but I really have a hard time believing big corporations any more..and the big airlines fall into that category. But as I sit here, I feel like screaming, because there are just so many holes in the story of why my plane is delayed. First, I fly the EUG-SFO route frequently, and each day, the same group of Canadair Regional Jets go back and forth, north and south, usually like clockwork. So why, oh why, does the airline ask me to believe the plane tonight is coming in from Calgary, half way to the North Pole? And while admittedly not an expert on the range of an CRJ, to go from the middle of Alberta to the coast of California seems like a job for a B737, not a regional jet. The southbound CRJ coming down from EUG had to divert to Fresno due to, um, low ceilings at SFO (even though the METAR was clear and a million). That means the plane wasn't available to go back to EUG earlier this evening, so it had to go to Calgary instead, for no damn reason...just because. So now, the plane that was supposed to be at gate 79 waiting to load me up was in Canuck land, waiting for real WX to break so it can fly to SFO. But because it is a CRJ instead f a 737, it may have to stop for fuel in Missoula, that is, if it ever departs Canada after waiting three hours for Homeland Security to make sure all pax have their newly-required passports on their persons. It finally arrives at SFO 7.85 hours late, and sometime early tomorrow – through the miracle of airline flight – it actually reaches EUG, my guess is about eight hours late. 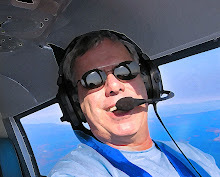 I left my son's house in San Jose tonight at 7P to head for SFO, and would have reached nearby Reid-Hillview Airport at 7:20P ready to pre-flight my SR22 had I been flying the friendly skies of general aviation. After returning the rental car and a WX briefing, wheels up would have been in the neighborhood of 7:50P. With a nice, peaceful four-hour flight, I'd have been wheels down at EUG at 11:50P...five minutes before the alleged (and delayed) CRJ promised by United was supposed to arrive here and get me as I wait...not so patiently...at SFO. 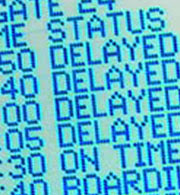 Limping along...the two words I use tonight to describe today's major full-fare airlines. Tomorrow, maybe everything will click like a Swiss watch...but tonight, I am less than impressed.